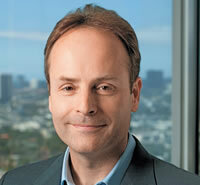 Claremont, Calif. (June 6, 2013) – Pitzer College alumnus and board of trustees member John Landgraf ’84 has been named chief executive officer of FX Networks and FX Productions. Landgraf joined FX as president of entertainment in January 2004 and was promoted to president and general manager of FX Networks a year later. Under his leadership, FX has reached all-time highs in ratings, revenue and the development of original award-winning programming with hits such as Louie, Sons of Anarchy, American Horror Story and Justified. In his new position has CEO, Landgraf will have broader responsibilities in running the network and the production unit as well as business operations. He will oversee the network’s launch of FXX, a sister cable channel to FX that will premiere in September and the rebranding of Fox Movie Channel as FXM. Prior to working at FX Networks, Landgraf was president and co-founder of Jersey Television. He served as the vice president of primetime series for NBC from 1994-99. Landgraf is actively involved with his alma mater, serving on the Pitzer College Board of Trustees since 2007 and as a Trustee Mentor to young alumni. John Landgraf received a bachelor’s degree in anthropology from Pitzer College.